meal with roti, dal, rice and chutney or with paratha, main course dish and raita (yogurt). 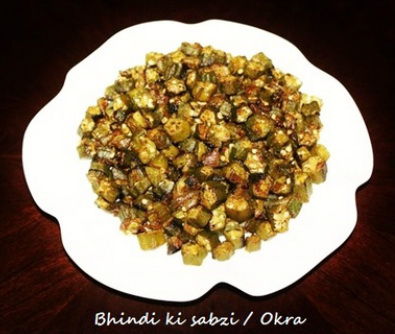 Bhindi is also known as okra or lady finger. Okra is a fuzzy, green, ribbed, fibrous pod. 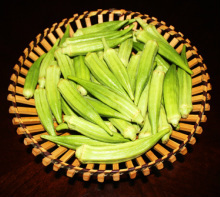 For the best cooking results, okra should be 3” long, bright green, young and fresh. Mature okra becomes tough and stringy. 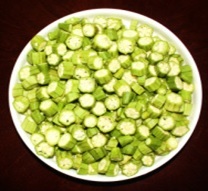 Okra becomes slimy after chopping, that may keep some people away from cooking and eating. Sliminess results when cut okra comes in contact with water. 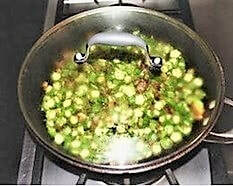 In North Indian cooking okra is never cooked with water. 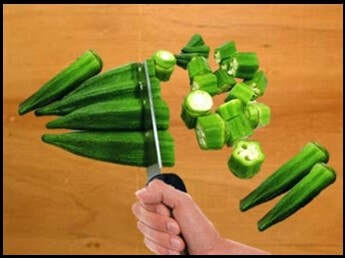 To eliminate slime, before chopping wash okra under running cold water, and wipe dry with kitchen towel. 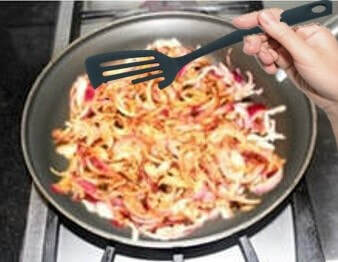 If properly cooked it is truly a delicious side dish. 1. Wash the okras pods well under cold running water. very bottom tip, and then slice it into ¼” thick rounds. minutes or until they become light brown. 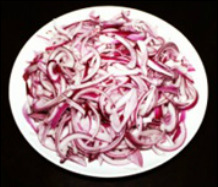 mix them with onions, and fry them for few seconds. moisture, with the water okra become slimy. that onion masala coats okra evenly. 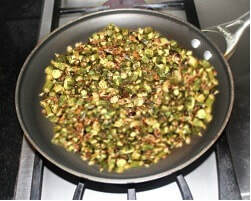 skin of the okra become crispy, or the way you like it , turn the stove off. turning the heat to high for few minutes. 3. Grind the fennel seeds (saunf) and make a powder.